Remaking 1974's Charles Bronson classic Death Wish always sounded like a bad idea. Even through the myriad of troubles had just finding a director and star for it, the prospect of a movie where a white vigilante makes nice with AR-15s, finds his inner Punisher, and starts shooting up anybody...let's just call them "urban", that he thinks did wrong was terrible with our current gun culture. Coming just a couple of weeks after yet another tragic mass shooting it was even worse, although to be fair we have one of those every day so there would never be a good time. As expected, the film is as tone deaf as expected, but so much else is wrong with it that audiences may be too busy laughing to notice. Set in Chicago, which has become shorthand for the alt-right (or the sitting President) when they want to highlight escalating violence by those darn urban folks, the story follows the path of the original movie and Brian Garfield's book. Giving a sleepy performance that suggests one of his many lousy straight-to-DVD roles, Bruce Willis plays Dr. Paul Kersey, a surgeon with a seemingly perfect home life. He's not exactly a man's man, though, as evidenced by the way he backs down from a loudmouth parent at his college-bound daughter Jordan's (Camilla Morrone) soccer game, leaving his wife (Elisabeth Shue) to step in. Paul would further wish he was more of a protector when a trio of armed goons bust into his home for a robbery, leaving a trail of death in their wake when things go wrong. Of course the detectives (Dean Norris and Kimberly Elise) are useless and can't find any suspects, so Paul takes it upon himself to get some justice, spurred on by his wife's rifle-toting father who bucks poachers like it ain't no thang. 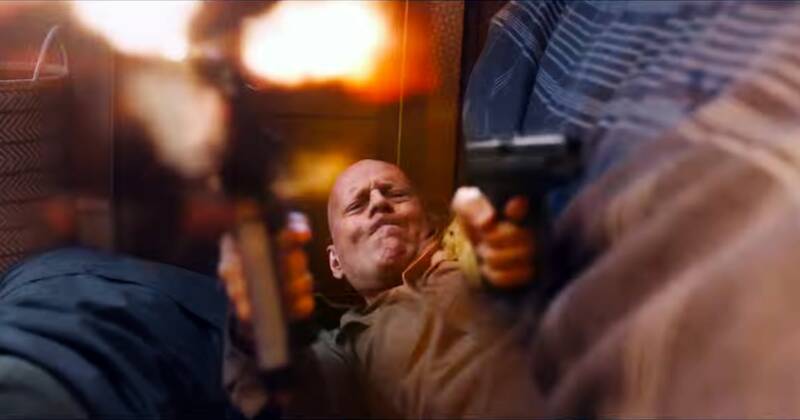 Ditching his scrubs for a gun, which he snatches from another in a way so brazenly immoral it drew gasps from the audience, Paul unleashes his anger and grief in a hail of bullets. To a much better degree the Bronson version of Death Wish explores how living in a world of violence can reshape a peaceful man's entire morality, but Joe Carnahan's rebooted script barely pays lip service to that level of consideration. Instead we get thin opposing banter from Chicago DJs Sway and Mancow about whether the "Grim Reaper", as Paul becomes known as after videos hit YouTube, is good or bad for the city. Neither gives the most compelling argument. In his most high-profile film yet, Hostel director Eli Roth only occasionally gives in to his appetite for gore. A scene where Paul tortures a perp in a garage with a variety of surgical tools and battery fluid is the stuff of nightmares. Over a jacked AC/DC soundtrack Paul plays judge, jury, and executioner with barely a thought to what he's actually doing. Are we to believe Paul is some kind of antihero, who violently disregards authority and takes the law into his own hands. 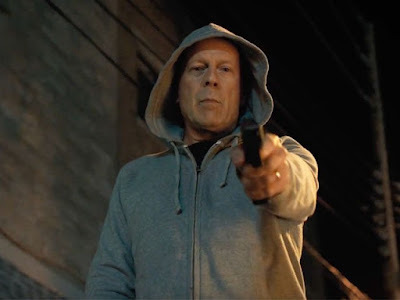 If this were the Marvel Universe and he were the Punisher we would cheer for him, but Death Wish is meant to be a reflection of our current society, not a fictional comic book realm. The film does everything that we really wish it wouldn't do, because there's the uncomfortable feeling that somebody will be in the audience taking notes. Paul sheepishly enters a gun shop where a pretty store clerk walks him through all of the weaponry, showing how "easy" it is to fill out the forms and pass the gun training course. "Everybody passes", she whispers to him innocently. Paul goes online and discovers a treasure trove of videos, each with one screaming, gun-toting host after another, who show him how to clean and take apart his weapon like a true soldier. The point is clear: If you need a problem solved and solved quickly, a gun will do it for ya. 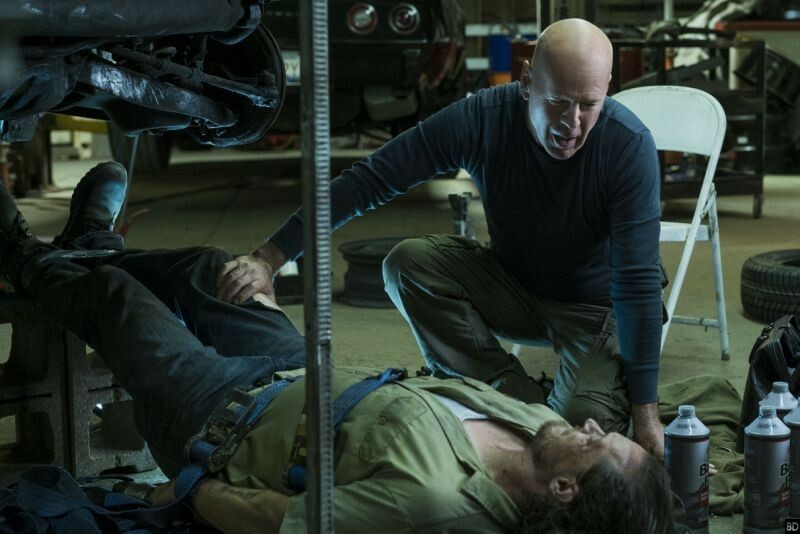 Misguided yes, but Death Wish is also just plain bad in other ways. It can't be overstated how disconnected Willis seems to be from it all. He's supposed to be one of Chicago's top surgeons but he doesn't seem to give a crap as he loses one patient after another, which is kinda funny because we never see him put up much effort to save anybody. Probably Willis couldn't be bothered to put in the extra work. This is clearly a situation where Roth settled for whatever Willis gave him on the first take. We get more emotion from Vincent D'Onofrio as Paul's shady younger brother, while Mike Epps makes a curious appearance in a role that was probably (hopefully) edited down significantly. Any scene involving Paul and his family or friends simply doesn't work. Willis seems disinterested and Roth seems ready to move on to the action, such as it is. The Death Wish story has been watered down for decades by hundreds, maybe thousands of copycat movies. While nobody expected this reboot to break the mold or anything, the complete lack of any ambition is also a real drag. Despite the violent times we live in this Death Wish would rather go off half-cocked than have anything useful to say.